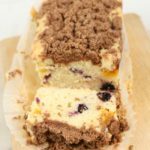 Sour Cream Coffee Cake is wonderfully moist, has a delicious streusel topping, and super easy to make! I really wish you could smell and taste this delicious coffee cake right now! Oh, it smells amazing! One of my mom’s best desserts was this moist and tasty Sour Cream Coffee Cake. Peaches and blueberries are in season right now, so I decided to use them! 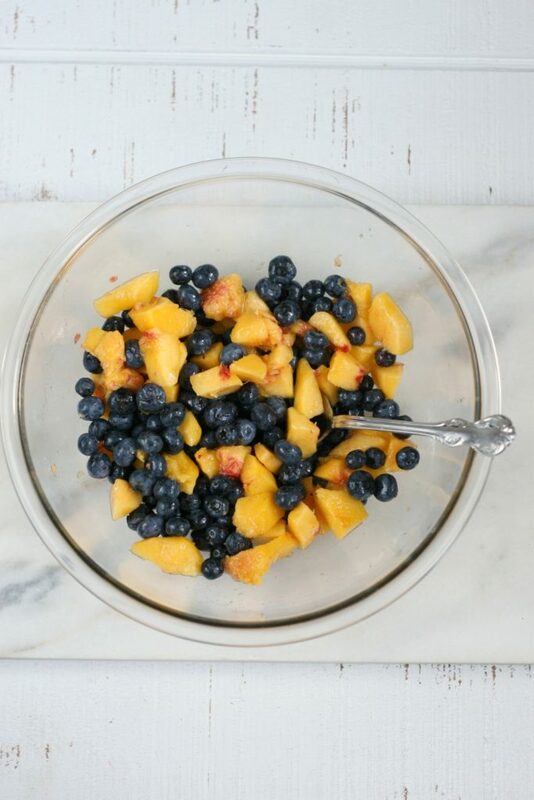 Cut up the peaches into small pieces and place in a bowl with blueberries. If you prefer, cut up two apples (Macoun, Granny Smith, or Macintosh) into small pieces and toss with a little cinnamon (maybe 1 teaspoon) and add to your cake batter. You’ll need a few loaf pans. Order here if you need. These paper loaf pan liners are amazing! No need for spraying cooking spray on your pans. Just plop these babies into your loaf pans and you’ll easily remove the coffee cakes, banana bread, and any yeast bread you bake. How do I make streusel topping? Simply add the ingredients to a bowl and press together with your fingers to combine. Add the desired amount of cinnamon to your liking. How do I make a coffee cake with a streusel topping? Step 1: Cream together the sugar and butter. Be sure and scrape the bottom and sides of the bowl occasionally with a rubber spatula. Step 2: Add the vanilla, eggs, and sour cream. Step 3: Add half of the flour and combine. Add the remaining flour and baking powder and mix until combined. Step 4: Fold in the blueberries and peaches. 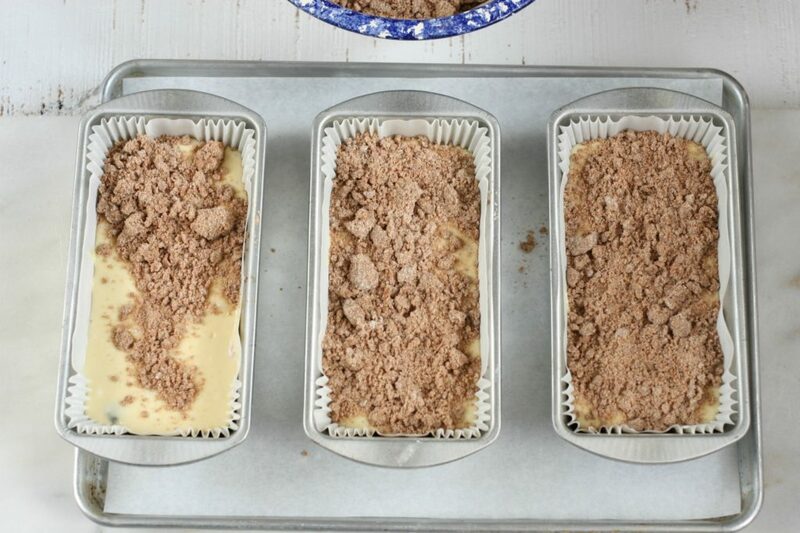 Step 5: Divide the batter evenly between three lined loaf pans. 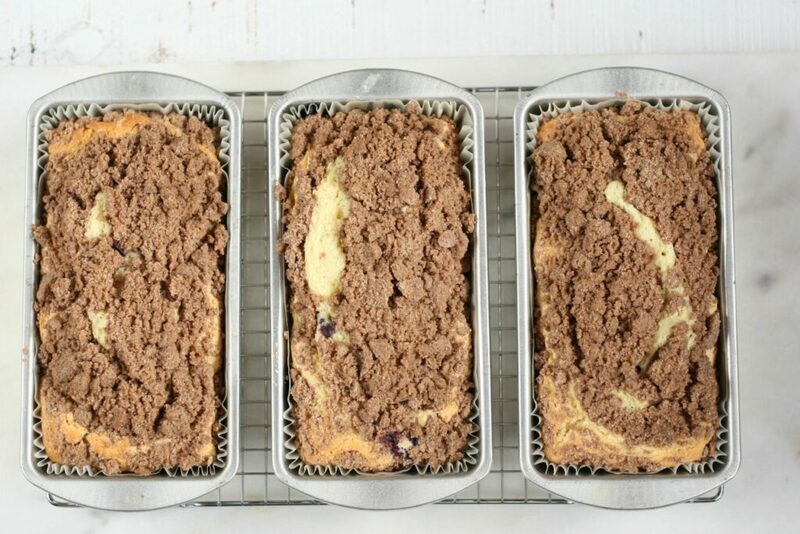 Step 6: Spread the streusel topping evenly over the coffee cake batter. Step 7: Place the loaf pans onto a half sheet pan lined with parchment paper. 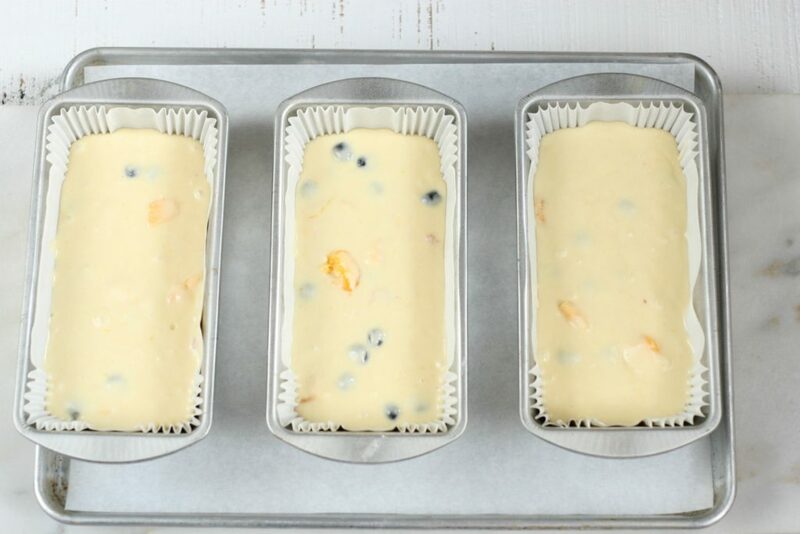 Place the cakes into a preheated 350 degree F oven and bake for 60 minutes. Test the cakes. They are done when a toothpick inserted into the center of the cakes comes out clean. Let cool for 20 minutes before removing from loaf pans. Do you love my recipes? Be sure and leave a star rating! In a bowl, combine the ingredients with your fingers. Adjust the cinnamon to your liking. Preheat the oven to 350 degrees F. Line three loaf pans with baking papers. Set aside. In a large mixing bowl of a stand mixer or use an electric hand mixer, cream together the butter and sugar. Add the salt, eggs, vanilla, and sour cream and combine. Occasionally scrape the sides and bottom of the bowl with a rubber spatula. Add the half of the flour and combine. Scrape the bowl again with a rubber spatula. Add the remaining flour and baking powder and mix until combined. Fold in the blueberries and peach pieces. Place the loaf pans on a half sheet pan lined with parchment paper. Bake in a preheated 350 degree F oven for 60-65 minutes. Cakes are done when a toothpick inserted into the center of the cakes comes out clean. Let the cakes cool for 20 minutes before slicing. This is mouthwatering! That topping is the best part! I know, right!? Gotta love that steusel topping!! Could there be anything better with a cup of coffee!? My husband is going to love this recipe, coffee cake is his favorite…but this recipe he will go crazy! Thanks Jessica for another mouthwatering recipe. I would eat so much of this. I’ve always been a fan of coffee cake! Yours looks so scrumptious. This looks so good! I will have to give this a try! 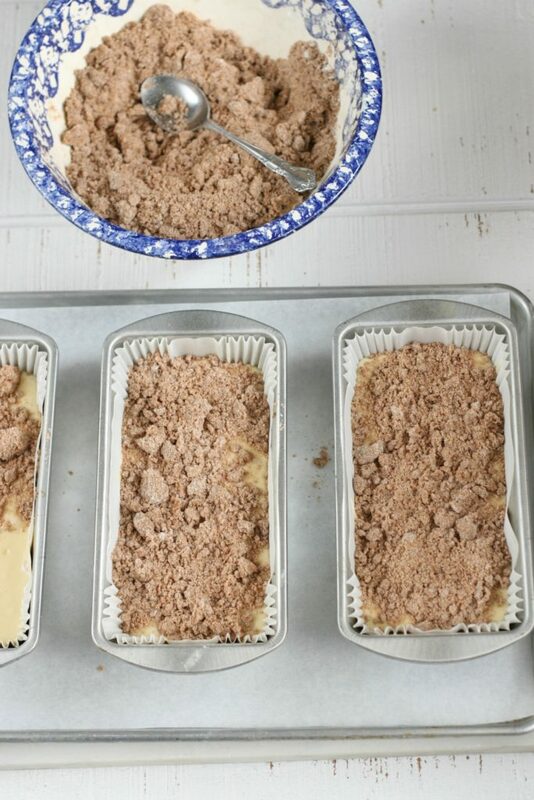 That crumb topping is what makes a coffee cake so yummy. I love the choices of fruit in this cake. Oh, yes! And I’m going to use that streussel topping for some other recipes, too! The way you explained this cake recipe, seems very simple and doable. Going to try this very soon. WOW, I didn’t know that streusel is so easy to make. I used to make coffee cake but I don’t add twists to it like these ones. I think, I NEED to try this wonderful recipe. Thanks a lot! Streusel is super easy to make and will store in a freezer safe Ziploc bag nicely in the fridge or freezer. The bag keeps all the smells from your fridge out of the streusel (like onions). This looks delicious! I love that you have the pan liners, I didn’t know those were a thing. I need some! Pan liners are AWESOME!!! I keep them in stock at all times! Me either. I need some. Thanks for the link and recipe. Wow looks great and so easy. I will give it a try. THE family would love it. This looks absolutely delicious! I need to make this right away. My kids would be so thrilled. I think it would pair perfectly with morning coffee! This is interesting! I don’t think I ever had sour cream cake when I still consumed dairy. Oh my goodness, this looks absolutely yummy! I’ve never tried a sour cream cake before, but omg I must try this! Oh! My! 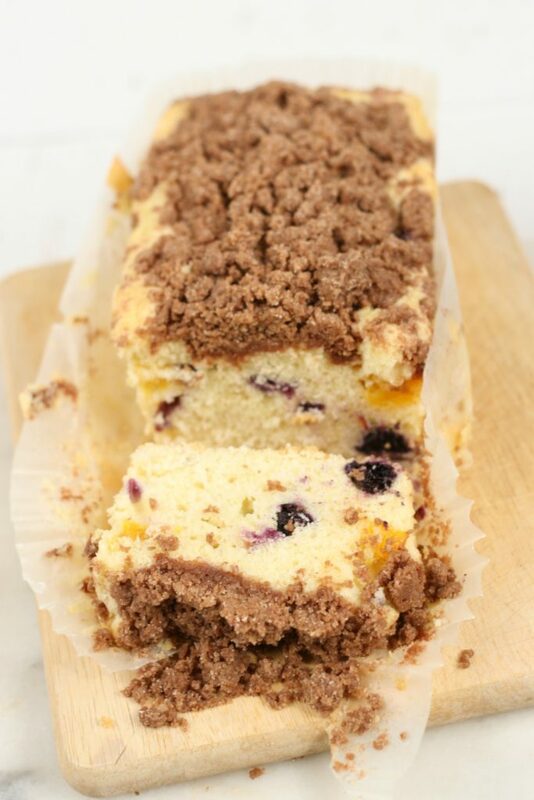 I absolutely love coffee cake and you have taken it to another level! I can’t wait to try this recipe. Hopefully I will have time tomorrow. I love the addition of blueberries and peaches. Ooooh! This looks so good. I never thought to throw in fruits for a coffee cake. The blueberry must give it a little added sweetness. It does look simple to make and incredibly mouth watering. I cannot wait to give this a try. I LOVE coffee cake. This one looks so good and totally up my alley too! Have you ever doubled the topping and put half of it in the middle instead of the fruit? I’m not crazy about the fruit snd think it might just be pretty good!! You can certainly do that! 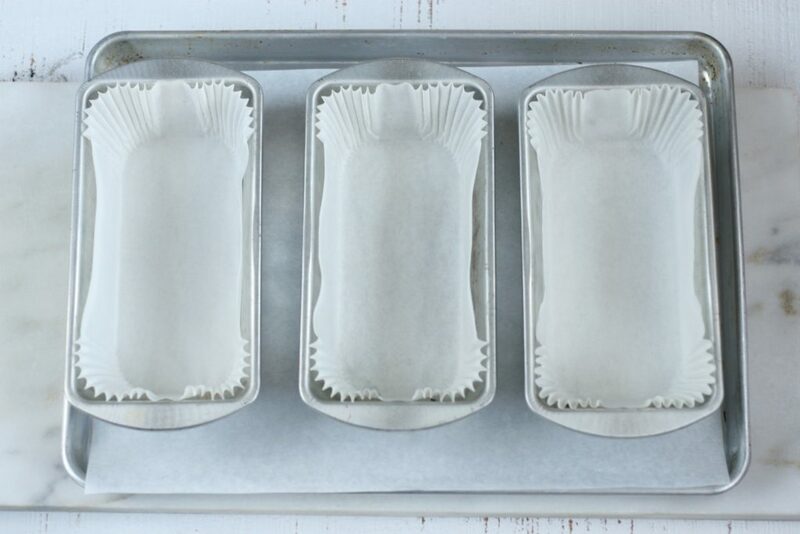 What size loaf pans are you using? Normal size loaf pans are a 9 x 5 inches. Could I leave out the fruit and make just a coffee cake with this recipe ? Thanks for stopping by! SURE! You can leave the fruit out. 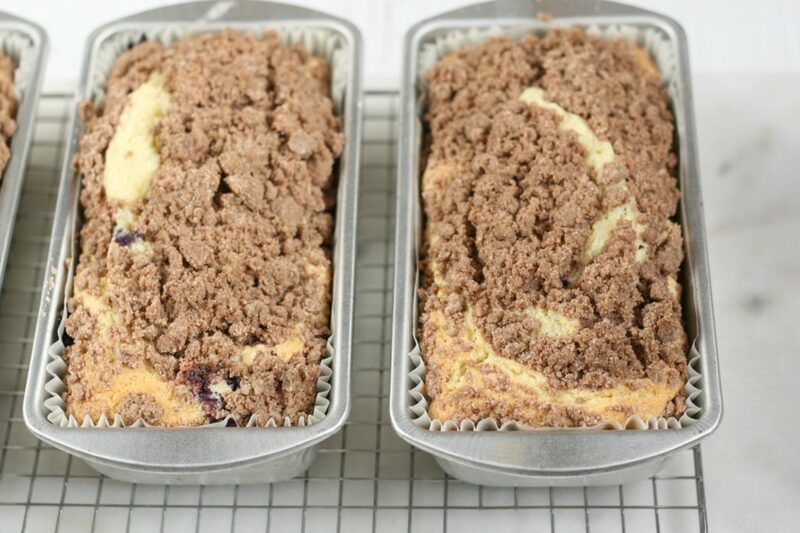 Just swirl some of the streusel topping in or leave it on the top. Glad you tried out my coffee cake recipe. Yes, the batter is super thick, it is NOT runny! Also, I tend to go heavier on the ground cinnamon, which is why my streusel looks darker. Just a preference in our household. Could I leave out the peaches ? Wondering if it will still be a moist ? Absolutely! Either use another fruit, or just do blueberries. You can even just do no fruit. Whatever you prefer. This cake is so darn delicious and moist! Can this bread be frozen….? Absolutely! This cake can be frozen and thawed to enjoy!